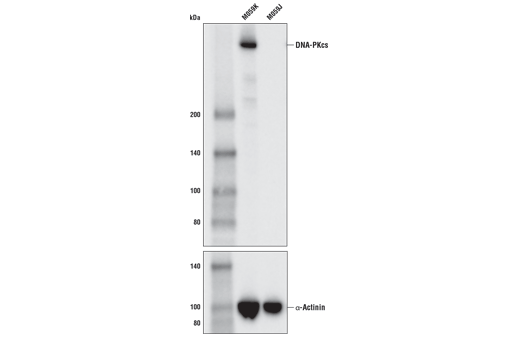 Western blot analysis of extracts from M059K cells, which express normal levels of DNA-PKcs, and M059J cells, which lack DNA-PKcs, using DNA-PKcs (E6U3A) Rabbit mAb (upper) or α-Actinin (D6F6) XP® Rabbit mAb #6487 (lower). 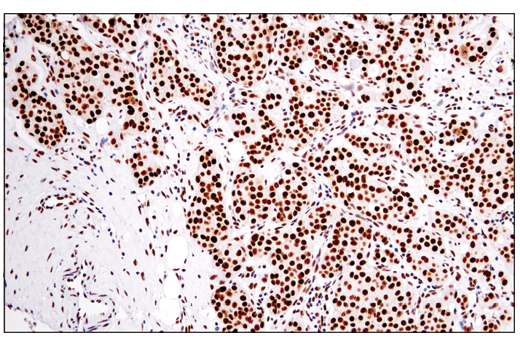 Immunohistochemical analysis of paraffin-embedded human ductal breast carcinoma using DNA-PKcs (E6U3A) Rabbit mAb. 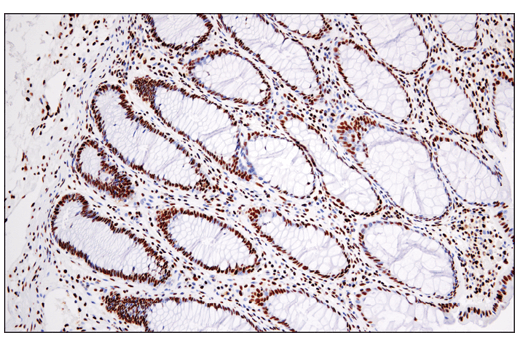 Immunohistochemical analysis of paraffin-embedded normal human colon using DNA-PKcs (E6U3A) Rabbit mAb. 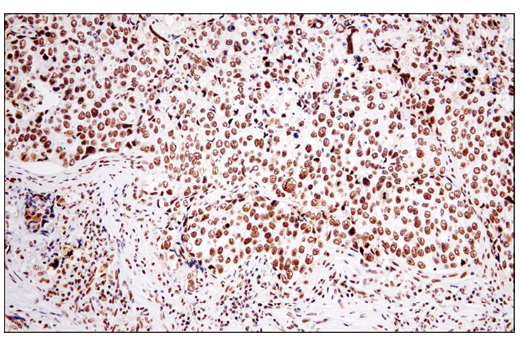 Immunohistochemical analysis of paraffin-embedded human renal cell carcinoma using DNA-PKcs (E6U3A) Rabbit mAb. 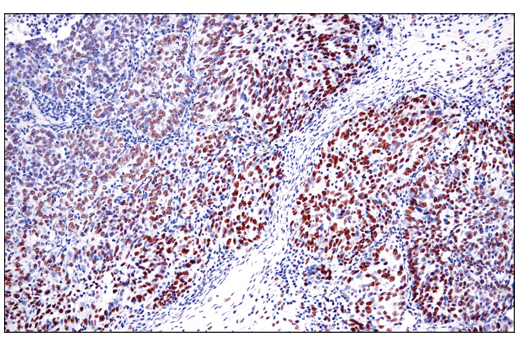 Immunohistochemical analysis of paraffin-embedded human lung squamous cell carcinoma using DNA-PKcs (E6U3A) Rabbit mAb. 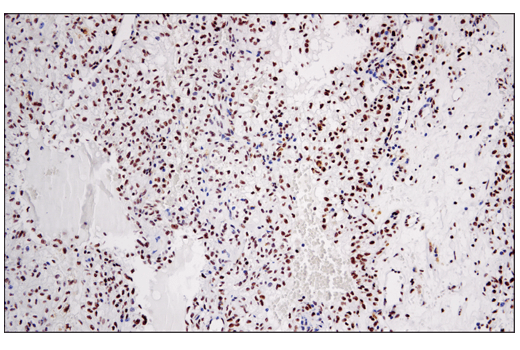 Immunohistochemical analysis of paraffin-embedded human endometriod carcinoma using DNA-PKcs (E6U3A) Rabbit mAb. 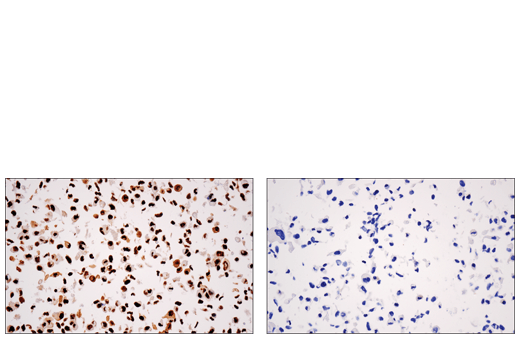 Immunohistochemical analysis of paraffin-embedded M059K cell pellet (left, positive) or M059J cell pellet (right, negative) using DNA-PKcs (E6U3A) Rabbit mAb. 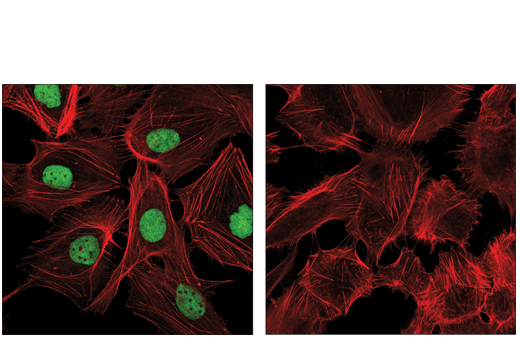 Confocal immunofluorescent analysis of M059K cells (left, positive) and M059J cells (right, negative) using DNA-PKcs (E6U3A) Rabbit mAb (green). Actin filaments were labeled with DyLight™ 554 Phalloidin #13054 (red). Flow cytometric analysis of M059J cells (blue) and M059K cells (green) using DNA-PKcs (E6U3A) Rabbit mAb (solid lines) or a concentration matched Rabbit (DA1E) mAb IgG XP® Isotype Control #3900 (dashed lines). Anti-rabbit IgG (H+L), F(ab')2 Fragment (Alexa Fluor® 488 Conjugate) #4412 was used as a secondary antibody. 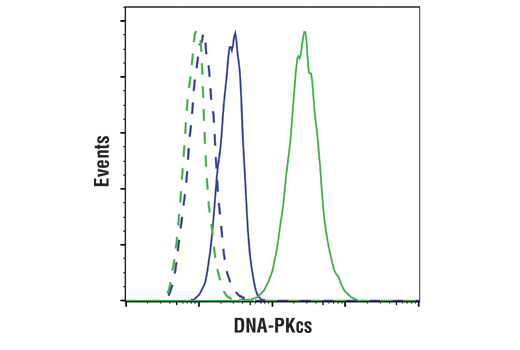 DNA-PKcs (E6U3A) Rabbit mAb recognizes endogenous levels of total DNA-PKcs protein. Monoclonal antibody is produced by immunizing animals with a synthetic peptide corresponding to residues surrounding Pro608 of human DNA-PKcs protein.